Two years ago today I received the life-changing sting that sent me down the path of bee Venom Immunotherapy. So far I've put 540 miles on the car and taken 147 allergy shots, about half the total number of miles & shots I expect it will take to complete the therapy. If I don't have any more adverse reactions to the therapy, I should finish by late-summer 2018. Until then, I have to carry epinephrine autoinjectors on me, the subject of today's post. There are three available in the US at this time. They all deliver the same medication, epinephrine, but each in a unique way. They come in two-packs, but I'm only showing one of each here, in trainer form. When your prescription is filled you get a needleless trainer, because in a life-threatening situation it's important to know how to properly use a one-shot device. You can practice with the trainer ad infinitum, but with the real deal there are no do-overs. The drug makers do, however, expect you to use the second injector in case the ER is further away than 15 minutes (but really I think it's because they want to force you to pay for two). 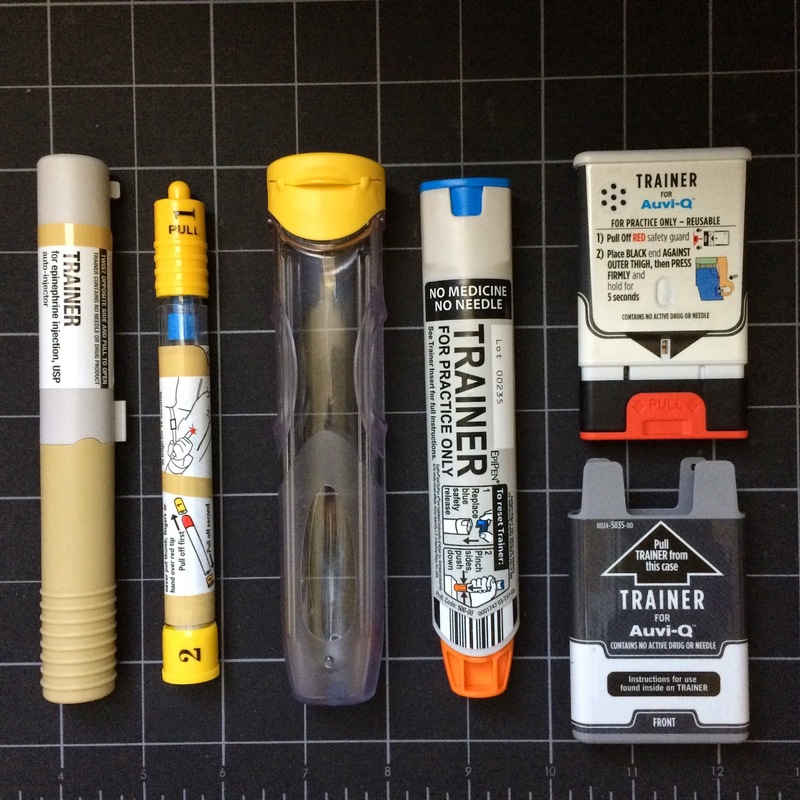 Epi-Pen® (pictured in the middle) is the most widely recognized. It's super easy to use. Remove from it's flip-top case, pull out the blue "brake" and plunge the orange end into your outer thigh. After use, the orange part springs back down, hiding the needle. It's a bit bulky to carry around. Auvi-Q® (on the right) is a new competitor to Epi-pen that is so easy to use, you don't even need to know how to read. It speaks to you as soon as you pull it out of the protective sleeve. Remove the red brake and press the black end into your outer thigh. The needle safely retracts, so listen for a click and hiss which indicate that the device worked. Slightly less bulky than Epi-Pen but slightly more expensive. Cash-paying patients will pay over $500 for this novel device. Although it has a brand name, Adrenaclick® (on the left) is a generic alternative, and therefore the least expensive of the three. Still, cash-paying patients will pay over $400 for it. It's in-between Epi-Pen and Auvi-Q in terms of ease of carrying but probably the most cumbersome to actually use. After removal from its case, there are two caps to pull off before you can plunge the orange needle-end into your outer thigh. After use the needle will be exposed, and that's how you know it dispensed the medicine. A word of caution, particularly with the Adrenaclick. Since both ends have yellow caps this injector is easy to use backwards, and one could easily inject their thumb instead. In a panic situation, any of these can be used backwards. The ER nurse told me that the epinephrine cuts off blood circulation when this happens, and you can lose your thumb or any finger that may have gotten dosed. Out of their cases, placed on a 1-inch grid for size comparison. The manufacturers usually offer a $100 discount coupon applicable toward your co-pay if you have one, and sometimes toward the cash price. Aside from cost and ease of use, portability is an important consideration. I think they are all bulky to carry around because an anaphylaxis kit should contain not only the two injectors but also 50 mg of Diphenhydramine HCl (an H1 antagonist such as Benadryl). In the event of a stinging incident, a fast-acting liquid or chewable tablets are recommended. I also carry Pepcid or Tagamet which are H2 antagonists because I have a crazy histamine response to booze known as Asian Flush. More on that later. Right now I am working on a blog "first," happening in the next week or so. It involves a giveaway so be sure to check back… or better yet add this blog to your Feedly or Flipboard.